“Homer tells us that ‘winged words’ are successful communications,” begins James Christensen, “and that words without wings are not as well understood and do not have the power to touch or move a listener. Two Sisters was created as part of a show I put together, "Winged Words," which was based on this idea of communication and on our attitudes towards each other. 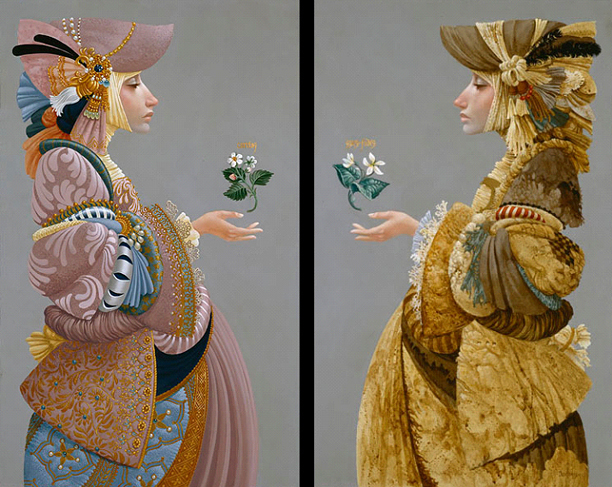 “The first idea that came to me for the diptych "Two Sisters" was somewhat cliché: the poor woman is virtuous and the rich woman, elitist; one good, one bad. But, then I thought about the inherent worth of all people, the wealthy as well as the poor. Both have gifts to offer to the world, each giving according to their ability. This is symbolized by the flowers and Latin words hovering above the outstretched hands. Rich in symbolism, these two paintings make a warm and wise statement: regardless of our specific circumstances, we all have a worthy contribution to make to our world!